If you park in the garage, we will validate your ticket so that parking is free! For centuries a major part of Irish culture and community has been the Public House. Every town in Ireland has their own pub, a meeting place in which members of the community can gather and relax, celebrate, and bond over a pint or a song. The atmosphere within the walls of Ireland's pubs is what makes them so famous around the globe. It is our pleasure to bring to you the combination of centuries...of Irish culture and heritage with a little Gaelic flair. A place where the community can come together to celebrate and relax. Enjoy amazing traditional Irish fare, a pint of cold beer, and the type of atmosphere that will keep you coming back for years to come. 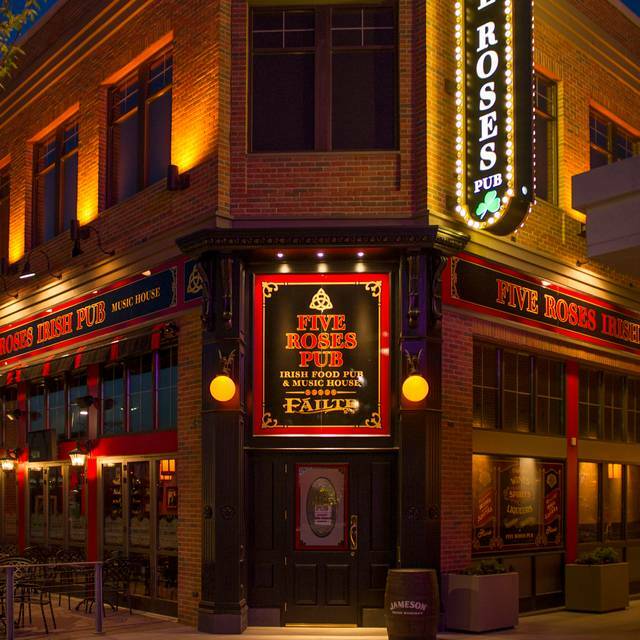 We bring to you, The Five Roses Pub. Great birthday experience. Live music was fantastic. Nice Guinness pour to boot! Service was slow, food took nearly an hour, then was cold and terrible. When making reservations, I noted we were celebrating birthdays. Never an acknowledgement from server, hostess, manager. Plenty of options in the area. Choose something else. We had a great waitress named Gemma. The music was a little loud as we were in a section right next to the band. Loved the atmosphere, food, and décor. Give Gemma a raise. She validated our parking pass and got us out in time for Zanies. Everything about the restaurant and ambiance exceeded my expectations. An incredible singer guitarist Griffin Crowder totally made the meal even better. Our server could not have been better. The food delicious, and the four of us tried different items on the menu and everything exceeded our expectations. Cobb salad,Tenderloin Steak Tips, Mashed Potatoes and Broccoli was the best. It seemed that this is also a very late night happening crowd and is a must for the party goer after 10:30PM. The pub itself was nice and they did have live music which we were not able to stay for as we had other plans. The food was ok, but nothing special, especially for the price. it was a bit drafty, but I'm sure it would have warmed up once it got busier later on. The worse part about the whole experience was getting there and parking. It was like a maze and considering it was Spring Break (and quiet) the parking was a nightmare. We will not be going back unless we get a limo or an Uber as it is not worth it. This place is me and my girlfriend's FAVORITE place to dine in Rosemont! The food is absolutely amazing, drinks are superb, friendly wait staff, and the live music they have (the guy jams) is just a couple of reasons we keep coming back! We waited over ten minutes and a waitor or waitress never came to the table to even take a drink so we got up and left. I would not recommend this place to anyone. There was a live band which was so nice! Our service was mediocre as the waiter would not come visit our table for 40 mins at a time and we’d wait with empty drinks for a while. Food and drinks were good though! Our service was non-existent. I had to go to the bar myself for our drinks for lunch. The waitress did say she was running around so we cut her some slack - thankfully we were pretty self sufficient. She never checked on us and we had to ask her for the bill. Our food was brought out by other servers. The food was good and the atmosphere was great. Restaurant Week Special was supposed to be a Grilled Cheese on Sourdough with bacon and tomato. Mine was just cheese and it wasn’t even melted (cold). Great food and drinks and good service. Nice server. Food did not taste good and was not cooked properly. Fish was undercooked. Very disappointed, it seems the quality has gone down since previous visits. I'm from Ireland and I've been living in Chicago for 4 years now. 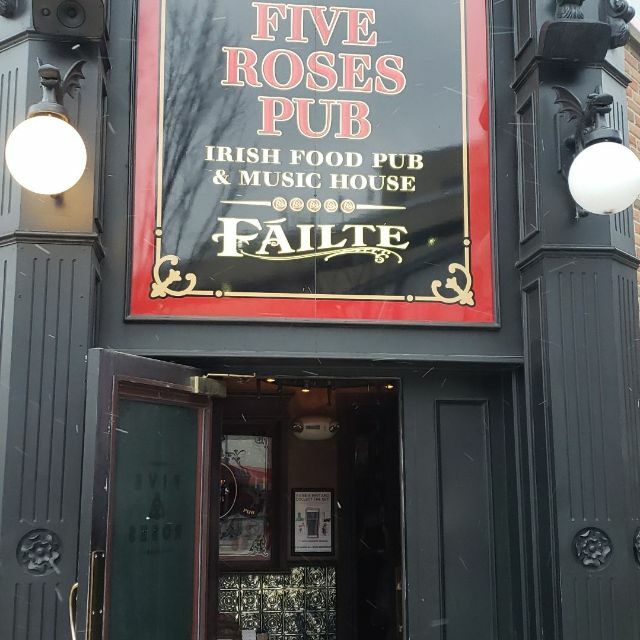 This was a date weekend with my husband and we decided to have a taste of my homeland and try out the Five Roses Pub. Of course we had the full Irish Breakfast and it was delicious! The inside was gorgeous and had a very Irish atmosphere. Overall a very happy experience and would receommend to anyone looking for an Irish feel. Had a pre-concert dinner here the other day. Great atmosphere and the service was impeccable. I had the Shepard's Pie which was delicious. My wife had the fish and chips but said it was nothing to write home to Ireland about. I will definitely return. Would have liked to have stayed for the live entertainment but had to leave. I was met with very good service and the food was incredible. The live music only made it that much more amazing. Get the short rib sliders and thank me later! And the brussel sprouts. Or the salmon. Everything I’ve had is beyond amazing. Love Five Roses so much! We met friends here for a drink and early dinner. Children running the host stand, which is never good. No welcome, no eye contact, no "hosting". We overlooked it because the place is nice and had a good atmosphere. Lots of people meeting for a drink and enjoying themselves. We asked for a quiet table so we could catch up with our friends. Just wanted to be away from the hustle of the bar. Seemed like a huge inconvenience for our hostesses, even though many tables were available. The server made up for things. He was friendly and told us about half price appetizers until 6, which were tasty. After that it all went south. The pub has live music, which translated to a full on outrageously loud concert. Don't get me wrong, the singer was good, but all the lights went out and the music was so loud that it made it impossible for anyone to talk to each other. At the bar, at the tables, in the restrooms, outside the pub. Lots of people started leaving. There are just too many other choices in Rosemont. Live music is great, but how bout after the dinner hour? The show would have been better received by all after 9pm. Oh well. Our waiter, Ty, was great! We enjoyed the live music very much! Griffin played all of our faves! I highly recommend the Boston Rum Punch! Service level was ok, quality of food is not great. The waitress put us at a table that was crooked & took forever to come back so we got up & sat at the bar. Bartender was good & made up for it. Food was ok..maybe just come in for a drink next time. Five Roses was an awesome experience new years Eve. Food was good and decently priced. Our server was attentive expcept for the last half hour we were there. That was when the DJ started. However she did make up for it. Overall a great exwpeience and will be back. Nice place with good food. Service was just ok. A bit slow but friendly. They weren't even open when we showed up, they had a private event but we were able to make a reservation. Nice bar & grill in Rosemont, at Parkway Bank Park. Despite Parkway's horrible parking garage, I was able to get a nice spot in the garage on a Saturday night, took an elevator down 4 floors, and I was at Five Roses in 3 minutes. Had a very tasty short rib cheddar melt w/ truffle fries and some great craft brews to wash it down. Service was solid and they had a one man cover artist playing guitar. Very noisy bar, but you kind of expect that. We chose it based on good reviews and its close proximity to Zanies, which we had tix for later that night. Very convenient 3 minute walk there as well. Would definitely go back again! Food was very good. It was very loud with live music in the bar and speakers everywhere throughout the restaurant. We found a nice cozy corner which was quiet. the bartender couldn't figure out how to make a dry martini. We had to send them back more than once. He/she thought dry meant lots of dry vermouth. The hostess said they were full even though we had a reservation so we sat at the worst table. High top with 2 kids is not ideal. Never filled up and plenty of open tables. Service was awful. Had to track down the waitress to get basic things like a refill and ketchup. Never checked in on us. Food was just so so. Had one night in Chicago and the pub was recommended. Great burgers, beautiful atmosphere, friendly staff. The hostess was unfriendly, and it took forever to get service but the food was good. Our party of 4 came here for a grown up night out and we chose the location because it was a great mid-way point for all of us. The room was great, the food was good and the drinks were reasonably priced. Our server, Nigel, really made the experience great. Good pacing, knew when to come around and shared in our laughter. He was a real credit to the pub. I would definitely recommend 5 Roses for a good night out. Staff and food was great only issue was I got a table close to the stage, the lighting was red and faced the table instead of the stage, so everything on my plate was red. Otherwise its a great place with good food, avoid the seats by the stage. Lively place, music could be lower for conversation . Food choices good for casual dining., bangers and mash were very tasty. Best thing was our waiter, Ty. He was fabulous to our group of 8! Parking lot is a challenge, but free with validation. Would try again if in the area. Our gals get together was terrific. In spite of being a little hard to get to, the restaurant itself is atmospheric, warm and the food is very good. We were seated a little out of the main stream of the restaurant - a good idea since girl groups tend to laugh and squeal a lot! High table with very comfortable booth seating on one side and comfy padded counter chairs with padded backs on the other. Our server was very attentive, knowledgeable and made great suggestions. Many and varied Beer and wine choices with something that will please every palate. A wonderful fun occasion and we will be back!!! I ordered a bowl of fruit to replace fries. 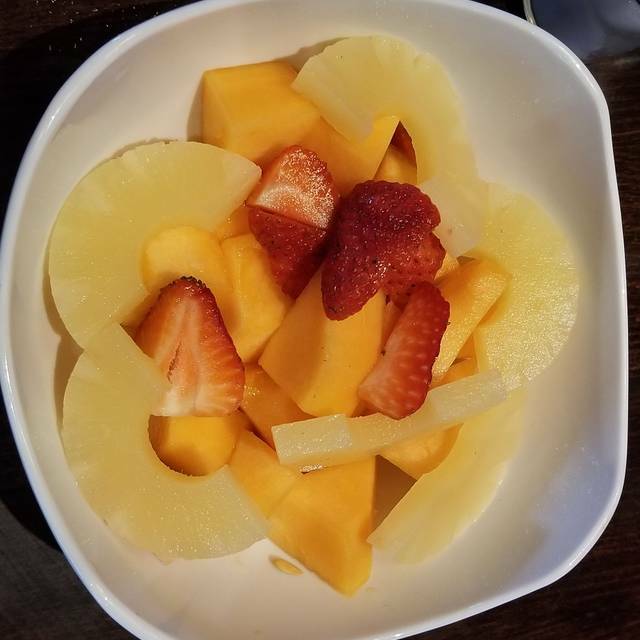 The bowl came with canned pineapple slices, old strawberries, and ok cantaloupe. Really disappointed that they thought it was okay to serve canned food.